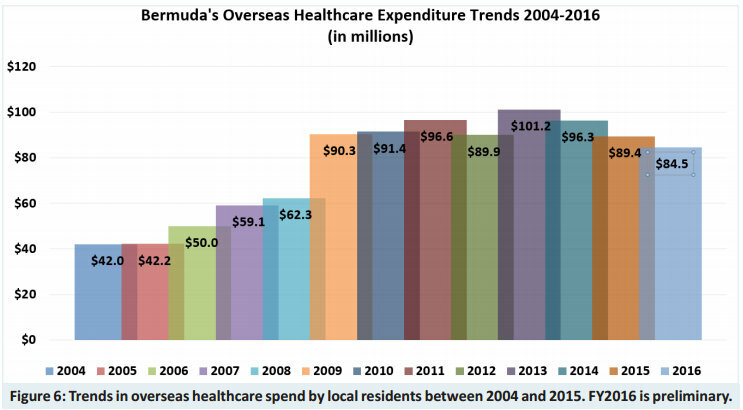 Bermuda spent $84.5 million on overseas care between 1st April 2015 and 31st March 2016, with $6M going toward transportation and accommodation, according to a new report from the Bermuda Health Council. “Recognising the importance of specialised overseas care to health outcomes, the Bermuda Health Council developed a report, Overseas Care: A Synopsis of Trends for the Island of Bermuda to provide a more in-depth analysis of how much money was spent, where and on what type of care,” BHeC said. “Bermuda needs to be wise about the resources that are available on island for healthcare. With 61,295 people, the quality of healthcare can be compromised by limited use of services, complex services or experience of those delivering care. “To ensure that Bermuda’s residents have access to specialized healthcare, strategic partnerships have been formed with overseas facilities enabling residents to receive much needed care. “For example, in 2015/16, 32 people went overseas for treatment for complex, brain-related injuries. Often, these injuries occur during road traffic accidents and require immediate need for assistance. Bermuda cannot provide these services to patients because of the lack of volume and trained personnel. “Providing these services would mean implementing expensive resources to perform procedures on a limited number of cases. More importantly, the quality of care for complex brain related injuries may be compromised. Lack of volume also means that local health professionals would not receive sufficient experience handling these cases. “Furthermore, ancillary staff such as nurses, and pharmacists may not be sufficiently familiar with these types of conditions to ensure they are doing their job well and patients are getting the best care necessary. Claims for overseas care and ancillary services were paid to over 5,000 different overseas providers. 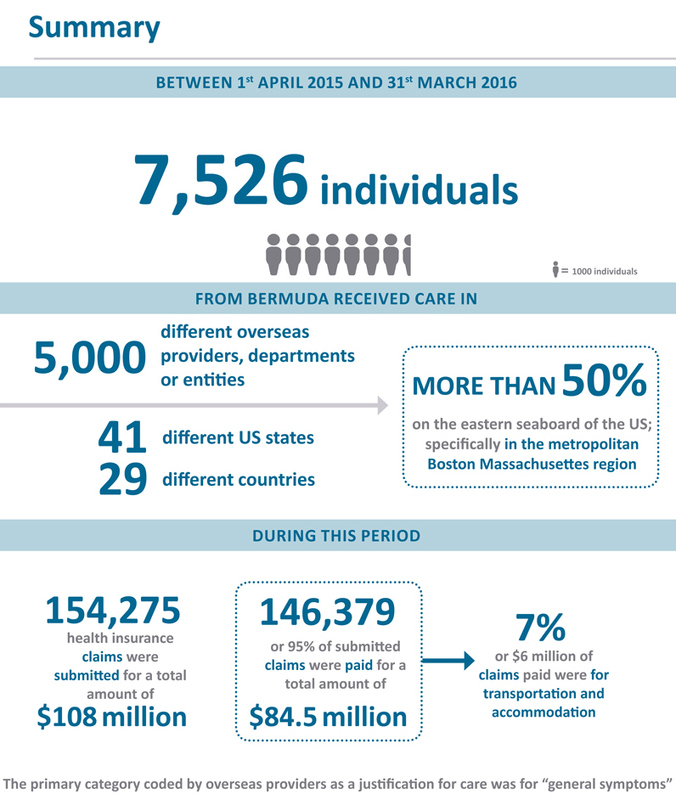 Massachusetts was the most utilised location for Bermuda’s residents to receive overseas care. On average, claims paid to overseas providers were $345 more than claims paid to local providers. The most common overseas provider types used [outside of hospital services] were paediatric care, spinal care, dermatology, radiology, pharmacy, pathology, psychology, ophthalmology and orthopaedic medicine. Expenditure in overseas care has more than doubled since 2004, although there has been a decrease in expenditure since 2014. Tawanna Wedderburn, CEO, said: “This Synopsis provides an opportunity for health professionals, especially specialist physicians, to take the lead in referring Bermuda’s residents to cost-effective facilities with good health outcomes. “The Health Council decided to publish this Synopsis, anticipating that it will encourage robust discussion and more critical thinking about the clinical needs of our residents. We also hope that insurers’ negotiations with overseas facilities would yield greater value for money. Ricky Brathwaite, Director, Health Economics, said: “Overseas care is funded by all residents through tax dollars, insurance premiums, out of pocket payments, loans and charitable donations. “We have a collective responsibility to take more control of our health and wellbeing, and its costs by having necessary conversations about healthcare. Bermuda’s residents should ask more questions about costs and quality. The council seems to be suggesting that the local specialist doctors are not presently ” referring Bermuda’s residents to cost-effective facilities with good health outcomes” Nothing in this reports supports that they are not already doing this! Further Insurers are quite capable of negotiating better deals for themselves and don’t need the health council to tell them that. I note they don’t mention how much residents have paid in premiums over this same period and the suggestion that we should be considering the countries mentioned as alternatives like the UK seems far fetched. Especially since their health system is funded primarily by their high income taxes. It is not the role of the provider to check on cost of a service when they are referring, in the same way that when drugs are prescribed, your provider may not know the current retail cost. The Council consistently collaborates on cost saving initiatives with insurers. We provide each of the system stakeholders with valuable insights, in the same way that they do the same for us. The role of the Council is to provide reasonable oversight to protect not only the system’s patients and providers, but also the impact on the rest of the economy. Regarding premiums, they go up as the cost of healthcare and/or the utilization of services go up. To cut costs we have to continually review where we receive services. Having the majority of individuals go to one area means that options are not being fully explored — even if that area is providing good service. My son is an avid cricketer and due a combo of oil slick on the road had a accident in Flatts and a downpour had his bike slide out from underneath him. He broke three metatarsal bones in his foot the result of which made his bones look like a W in an x-ray as oppose to three straight bones. A local orthopedic surgeon attended the hospital spent 5 minutes with us and discouraged surgery by telling us to allow the injury to heal as it was. It so happened that my brother was travelling by plane and sat next to an overseas orthopedic specialist who ended a vacation early to head home himself. My brother showed the specialist the x-ray on his phone and explained my son’s level of activity in sport and the specialist said if my son did not have surgery in the next week he would never play sports again. Needless to say my son’s pediatrician wrote a referral and I argued for my local insurer to support us to get him overseas to Johns Hopkin who had seen the x-rays and was very concerned for how the bones would heal. Needless to say my son underwent a four hour surgery at Johns Hopkins, an hour beyond what was estimated to removed all the shattered bone from his foot. He has rods in his foot holding his bones together and with dedication within a year as back to playing the sport that he is skilled in. We had excellent service overseas, a family liaison was assigned to us by the name of “Adey” and she was my Angel. We were treated like family, and pre-op the surgeon even explained what he would do as a parent if his son was facing the choice to have surgery or not. All this to say, I would not change my decision EVER. When we as locals who pay for the benefit of insurance feel as though a second or third opinion is warranted, we should be empowered to follow our instincts and make the best decision for ourselves or our loved ones. I can only imagine the challenges my son would have faced if we had decided to go with the local “specialist” recommendation. We paid and continue to pay insurance every month and this was our first major local hospital visit in twenty years. I would like to think that if I had the option to seek care overseas where I was not confident with the local specialist advice – I would always have the option to do so. The health insurers surely like to boast on their quarterly/yearly profits but put up a huge fuss when time to pay out…. Exactly…the premiums are higher here than in U.S.
Also, if they screw up, they renumerate through liability insurance they carry. That,in and of itself,is the better deal. To infer the cosumers choice is not theirs to make is ignorant and over reaching. Patient medical care locally is generally sub-standard. As long as persons are paying dearly for insurance their health care choices should be theirs alone! Everyone does not have a choice or chance to go somewhere else. Therefore it benefits everyone if we can have open conversations on what we can do to improve care locally.